It literally came down to ONE vote that put Kermit and Yara on top of Miss Piggy and Reva. Poor Reva... always the bridesmaid and never the bride. But I do happen to love Yara. I never thought this olivey color green was for me. I thought it would make my skin look yellow. But I must say that this is a much more flattering shade for me than I thought it would be. This type of army green is actually nice with my skin tone. The gold glass flecks are the exact same color as the flecks in Neeka and I really dig them. SPARKLE SHOT! So what do you think, ladies? Is Yara your shade of green? 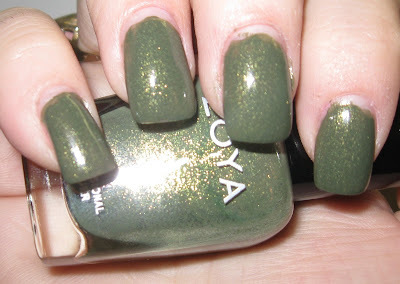 Or is there another Zoya you like more? Lady Winter has reared her ugly head here in New Jersey, so for Day 15, pick from Breezi, Tao, and Ibiza! Never thought I would like green nail polish, but somehow I've accumulated quite a few, I might have to add Yara to my collection. And I vote for Tao! @Meli, I feel the same way. But I'm much more into the blackened greens (a la NARS Zulu) and rich greens (a la Zoya Holly). Who would have thunk it? I think Ibiza is so pretty for this time of year! @Gingey, I've been hearing all about Edyta for a while now... I should just bite the bullet and get it!